A I didn't hear John McLelland's comment but I'm as intrigued as you are. Rangers had played 240 matches in Europe up to the end of season 2003-04 (NOT counting the 'Super Cup' v Ajax in 1972-73 which was unofficial) and TEN clubs have played more - Barcelona 373, Real Madrid 368, Juventus 334, Bayern Munich 294, Inter Milan 281, Anderlecht 280, Ac Milan 260, Benfica 253, Ajax 245 and Porto 243. Liverpool with 223 are the most experienced English side and Celtic with 215 the next Scottish one followed by Dundee United with 102. Based on UEFA's own ranking system, Rangers are 13th in the all-time table with Celtic 17th and Dundee United 66th. The top English clubs are Liverpool (10th) and Man Utd (11th). If the Rangers chairman was thinking solely of the European Cup/Champions League then Rangers have played 124 times prior to this season. ELEVEN clubs have played more games - Real 274, Bayern 188, Juventus 164, AC Milan 157, Dynamo Kiev 153, Benfica 152, Man Utd 151, Barcelona 140, Ajax 137, Anderlecht 135 and Porto 129. Man Utd are the most experienced English team and next nearest Scots are Celtic with 102 then Aberdeen with 12. In these rankings Rangers are 13th, Celtic 14th and Aberdeen 116th. Man Utd at 5th and Liverpool in 11th are the highest ranked English sides. The only thing I can think of is if John McLelland was thinking about the number of SEASONS in European competition, as opposed to matches or ties. In this respect he is right, as Rangers are joint fourth alongside Juventus, Benfica and Sporting Lisbon with 44 appearances up to and including 2003-04. Real Madrid lead the way with 48 followed by Barcelona on 46 and Anderlecht 45. Next nearest Scots are Celtic with 39 then Aberdeen on 26. Most by an English club is 32 by Liverpool. A I suspect you are thinking of Alex James who was in the Raith Rovers party bound for the Canary Islands in 1922 when their ship the 'Highland Loch' ran aground off Vigo in North-West Spain. Fortunately there were no casualties and Rovers went on to play and win all four matches on their tour. The party included two players capped while at Stark's Park - Bill Collier and Dave Morris - but it was the then comparatively unknown 20-year-old James who had the most successful career, with Preston and particularly Arsenal as well as being one of the 'Wembley Wizards' of 1928. A McAvennie made his debut on November 20th 1985 in a World Cup play-off match against Australia at Hampden and scored the second goal in a 2-0 victory. A FAQs (Frequently Asked Questions) can be found on many websites and SFA stands for (amongst other things) Scottish Football Association. So a neat amalgamation of acronyms gives us SFAQs which means Scottish Football Answers (to) Questions. A Bobby Johnstone was the first, but not the only, player to score in two successive WEMBLEY Finals. Prior to the FA Cup Final moving to Wembley in 1923 at least five players had previously scored in successive Finals - Bonsor (Old Etonians) 1875/76 was the first. However, as his goals came in the first game in finals which both went to replays he didn't score in successive matches. Jimmy Brown and James Forrest of Blackburn Rovers both scored in successive matches in 1884/85. The first-named of that pair is the only player to score in three successive English finals, netting again in the replay in 1886. Two more Blackburn players - William Townsley and John Southworth - both scored in 1890 and 1891 - Townsley scoring a hat-trick in 1890. There is some doubt over the identity of the goalscorers in the 1878 and 1883 finals so it's possible there were more. Since Bobby Johnstone scored in 1955 and 1956 two more players have done so. Bobby Smith in 1961/1962 for Spurs is the only other player to score in two successive Wembley finals and the only one to do so for the winning team on both occasions. The most recent player to score in two in succession was Arsenal's Freddie Ljungberg in 2001 and 2002. In Scotland seventeen players can claim to have scored two years in a row, depending on interpretation. William Mackinnon of Queen's Park scored in the first two Finals in 1874 and 1875. Team-mate Tom Highet scored in the 1875 and 1876 finals plus the replay in the latter year. Dumbarton's Robert Brown was on the losing side against Queen's Park in both 1881 and 1882. He scored in both years but the 1881 match was replayed after a protest from the Sons. Brown didn't score in that match nor in the 1882 replay. The first Rangers player to score in successive finals was Alec Smith in 1897 and 1898. Sandy McMahon was the first Celt to do so in 1899 and 1900. McMahon also scored in 1901 to become the first to score in three successive Finals. Peter Somers of Celtic scored in 1907 (2) and 1908 - the first to do so at the present Hampden Park. Also on target in that latter match was Jimmy Quinn who scored in both the first match and replay of the 1909 Final when the trophy was withheld after fans rioted. 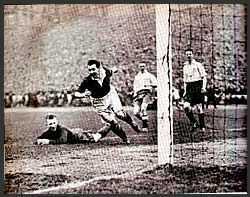 There was a lull until Jimmy Smith of Rangers scored in 1934 and 1935 (2). Next up was another Rangers player - Billy Williamson in the 1948 replay and again in 1949. Davie Wilson scored for Rangers in 1962 and the replay in 1963 but team-mate Ralph Brand's record was even more impressive, scoring in 1962, the first match in 1963, netting two in the replay then scoring again in 1964 to equal McMahon's three finals in a row and set his own record of four games in succession. Bobby Lennox became the third - and, to date, last - to score in three successive finals when he did so for Celtic in 1969, 1970 and the first match in 1971. Lou Macari scored for Celtic in the 1971 replay and found the net twice in 1972. Derek Johnstone's claim is a bit more tenuous. He scored in 1978 but the first two games in 1979 finished goalless. Johnstone scored twice for Rangers in the second replay. John McDonald was on target twice for Rangers in the 1981 replay and also scored in 1982. Eric Black of Aberdeen became the first non-Old Firm player in over 100 years to score in successive finals in 1983 and 1984. Most recent to hit a 'double' was Mark Hateley of Rangers in 1992 and 1993. Hateley is also the only non-Scot on the list. A Jimmy McGrory (pictured below) is the all-time record goalscorer in Scotland with a grand total of 550. He scored 410 in the League, 77 in the Scottish Cup, 33 in the Glasgow Cup, 18 in the Glasgow Charity Cup and 12 in representative matches. Apart from representative games and 13 for Clydebank in 1923-24 all his goals were scored for Celtic.